The market retraced to the minimum expected Fibonacci level and if the bearish count is correct, we should see continued selling tomorrow or Wednesday. The market tested the trend average as expected (which is currently 1287) and closed below this number so I am assuming the bearish wave will continue. However, we do need another decisive sell off to break 1271 to confirm and we can not have any closes over 1287 as that would start changing the trend to the positive side. As far as news is concerned, the catalyst for the current sell of is Egypt and that situation remains largely unresolved as reflected in Oil prices. There will be a big march tomorrow so we'll see how the market deals with the news. Technically speaking, this should serve as a good excuse for a big sell off but who knows in this mania driven market. I will cover shorts at any sign of the bearish trend turning positive again. We finally had a sell off today that broke the trend convincingly and the market closed exactly -1% away from yesterday's trend average, so chances are high that a multi-week correction has started as the trend turned bearish today. However, we do need another close below the trend to confirm and break last week's low of 1271. 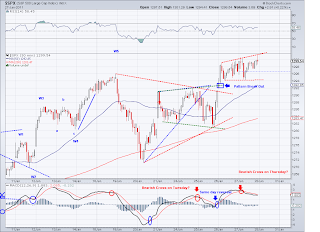 A close above 1288 will reverse the bearish trend. I had been wondering what the catalyst for the sell of would be for weeks and who would have thought it would be Egypt?? The 1300 target was met today as speculated earlier this week and now the index is again at what could be a set up for a top. This last wave hasn't been all that impulsive and I am starting to see the media talk more and more about a coming correction. So when it happens, it will probably happen very fast.Standard and Poor's for instance is calling for a correction of up to 10% in the next two weeks (a very bold call) and people like Marc Faber calling for similar corrections. But while this is obvious at this point, the question still is where will the top be and how deep is the correction going to be. 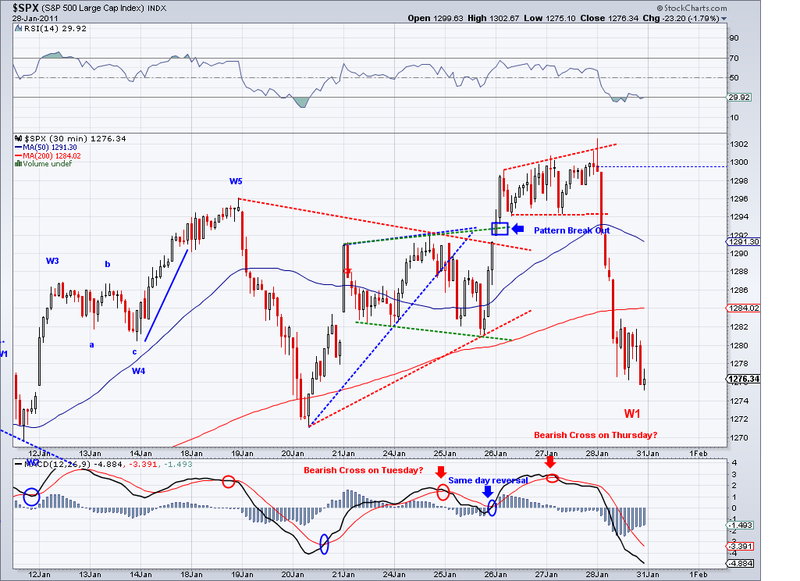 Most people are calling for a healthy pullback but some EW counters are calling for an all out crash. And like I said last week as long as we stay with our friend (the trend), we are one step ahead already. Currently, that trend is at 1290 and rising. The market did as what I expected yesterday and we had the bullish run to 1300, although it fell short by less than a point. I thought the break out was going to be a clear bullish gap but instead it bounced around in the first few hours and that is a sign of weakness imo. 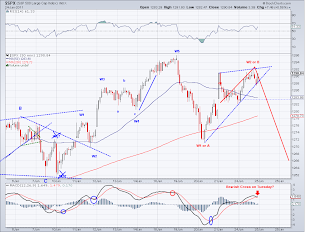 So the pattern might end up being a Rising Wedge or Ending Diagonal for the 5th wave. I was pre-emptive today and re-shorted my abandoned positions from yesterday(1291) at 1299. I figure at the very least we should have a test of the rising trend average, currently at 1288.5 and the fact the market was choppy makes me think there was lack of conviction despite all the "good news" today. 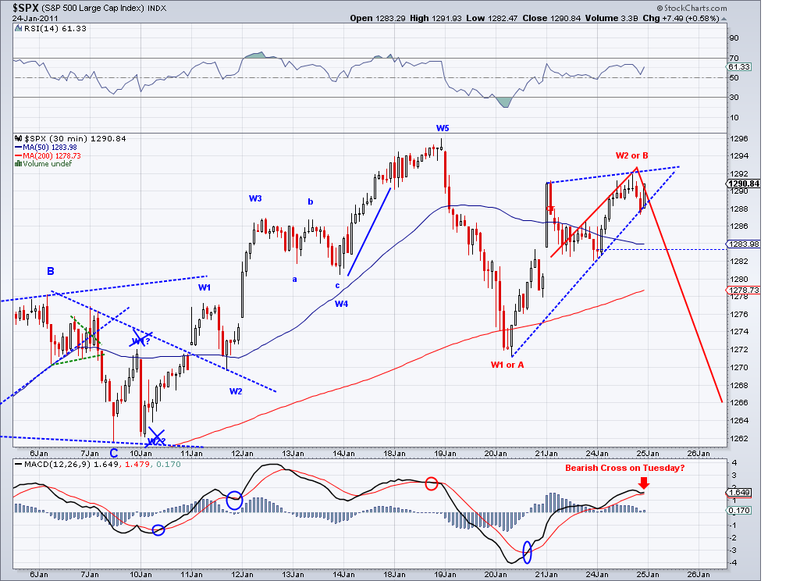 So if we get a lackluster correction that's starts hesitating in the high 1280's area, I will cover again. But if we get that strong sell off (which we haven't seen in months), then I'll start selling my longs and hold on to shorts. 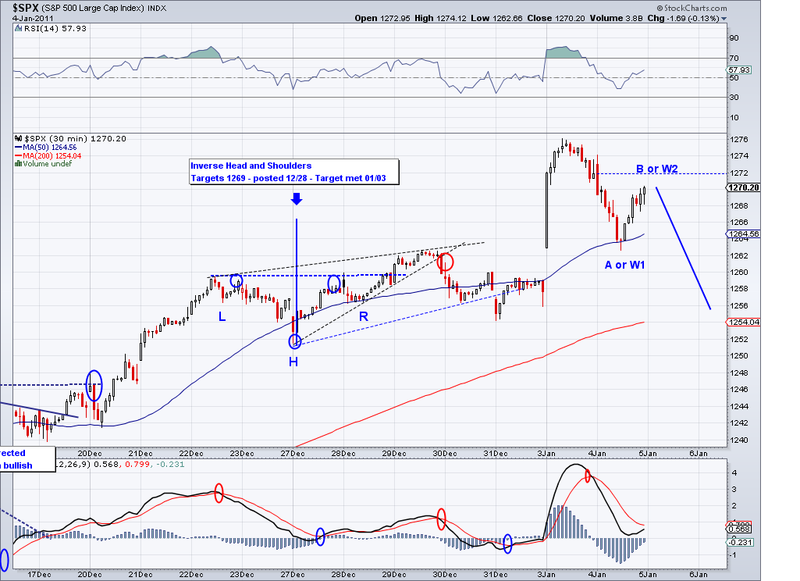 The ideal sell off should come in a big impulse wave to ends up closing at least 1% underneath the trend. 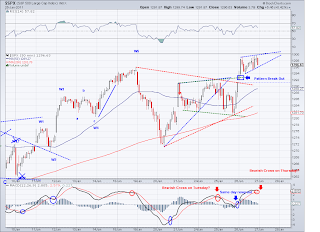 S&P 1300 coming this week? The market continued to bounce today at the 1280 range and it closed again above the trend average (which it now stands at 1287) and this to me points to a high probability of yet another high. Also, the MACD reversed its bearish cross towards the end of the session today and that's usually a sign there will be a bullish run the next day.It seems to me like 1300 is an obvious target and we'll most likely get there on some sort of break out. So I closed my short positions today at break even and will re-enter at a better (or safer) price point. 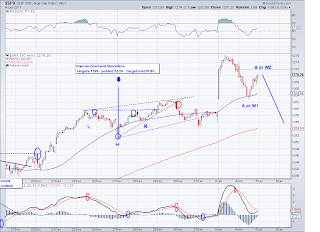 The rally (from 1041) will come to an end sooner rather than later but there is no point in shorting as long as the trend continues to be this bullish. So far the correction that took place last week has avoided closing below the trend average consecutively and like I said last week, hesitation at the 1280 level increases the probabilities of another leg up. However, the possibility of the market turning down hard this Tues or Wed is not out of the question because of the way the waves are structured and a likely bearish cross on the MACD. Rally tops can be sudden and quick but other times they will grind slowly so we just have to wait and see. My stops on my shorts did not trigger and my long positions are still intact. Maybe it will some sort of earnings disappointment that will be the catalyst for the coming correction? I am planning to start a portfolio to start tracking all the trades and results of my trading methodology soon. 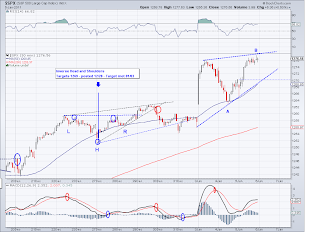 I will announce buys and sells on this portfolio and my goal is to simply beat the S&P 500 by using a combination of Trend analysis, Traditional Technical and Elliott Wave Theory. I believe the methodology I've been practicing will yield superior results and the only way to prove it is by comparing results with the indexes money managers usually try to beat. If this experiment turns out well, I will eventually write a newsletter with real time buy and sell recommendations for investors who are interested in my system. 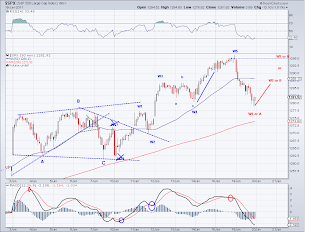 The market ended up going up to the higher "B/W2" label and this should have completed an ABC move from the 1271 low. So if the chart is right, we should see continued selling on Monday to the 1260-1265 area (anything below 1271 will work for the bearish case). The market however failed to confirm a bearish change of trend by closing just above the 1283 trend average, which still gives the bullish case some hope. As I posted on Monday, if the market starts hesitating around the 1280 level without breaking this level convincingly then it will just mean it is getting ready for 1300. So my strategy is to cover at break even on my shorts (1291.5) if the market decides to rally and catch it again at a new high. The market ended up going down more before the Fib retrace and now it has finally closed under the trend average at just barely underneath it by 1 point. In order for the bearish wave to start, we need to see a strong sell off (1% plus) under the trend average or at least keep closing under 1281. However, if the market maintains strength at this level and starts to close above the average then we will likely test the high and possibly put in a new high. 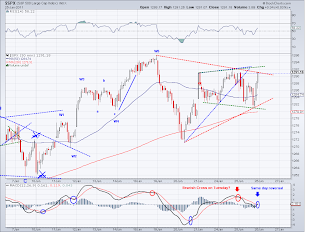 As it is right now, we need confirmation to call 1296 the intermediate top. Odds are imo the correction has started but I still have my longs just in case. 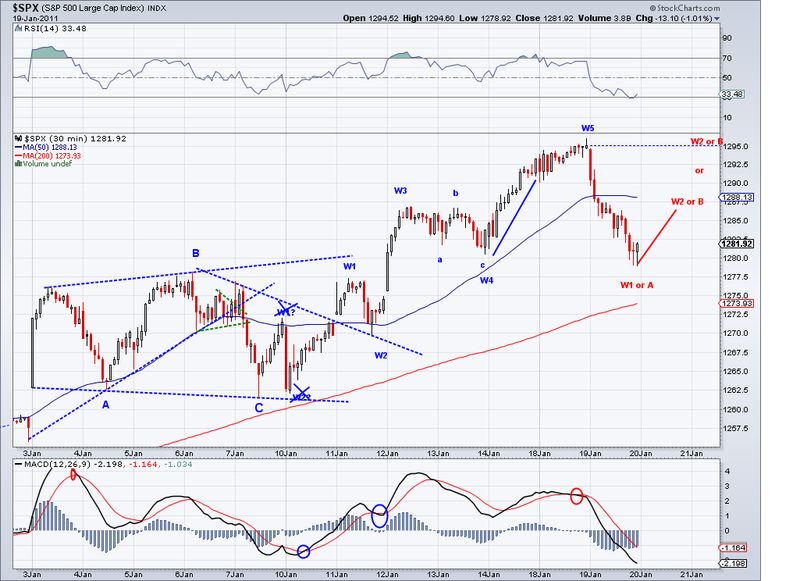 Top or another W4 correction? The correction started today as I speculated yesterday and the market found the 1280 trend level I mentioned significant as it did a little song and dance around this level but managed to close slightly above it. And as I noted yesterday, if there is hesitation around this level, the market might just be correcting yet again to prepare another impulse. However, if the market does a retrace to the 1285-1290 level (or even 1295-1300 in case it turns out to be a "B" wave) and then heads down hard breaking this support trend then we can finally call this "the" top for the rally. Currently the trend level has risen to 1281 so this will be the level to watch tomorrow and possibly on Friday as well (it changes differently everyday). I might use the retrace to start selling my long positions from early December. The 5th wave looks completed to me at this point. It is about 1:1 with W1 after the ABC move (W4). So looking for a correction to start mañana. There might be still just a little more left but technically speaking it should be done now. I am looking for a strong sell off closing below 1280. Anything that starts hesitating around the 1280 will just means there is more fuel in the market for yet another push up. In a way, I don't know how can this go much longer. Investor sentiment is at the most positive since 2007 (before the big crash) and we are breaking records already with the most consecutive up weekly closes EVER.. so probably now that the avg Joe will finally takes the money he has been hesitant to invest in the market and finally buys in. Crash 2.0 might just occur.. I am for a correction as I've noted before but one never knows. But as long as we're with the trend, there is nothing to fear. So now we have to see what the coming correction will be like. If the wave that takes us down to 1100's bounces hard, it will probably mean we will see a huge market rally for the rest of the year. The only way I see this bullish intermediate wave turn would be a breach of the 1010 summer low, which at this point seems unlikely. 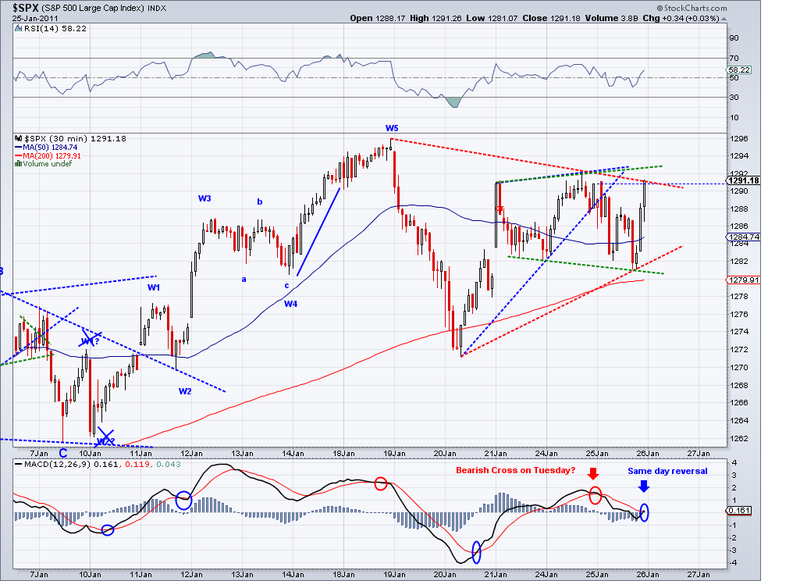 So for Monday, I am looking for a break of 1278 and consecutive closes below it to call this a top. In the meantime, I re-shorted today the position I covered from yesterday at 1291.5. I will be selling my longs on the first close below the "level". I will post a chart later as my chart site is slow today. 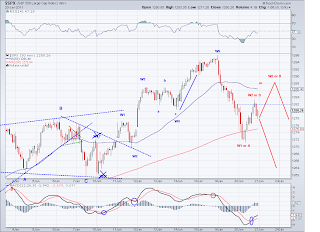 The market seems to have completed an ABC move of a W4. 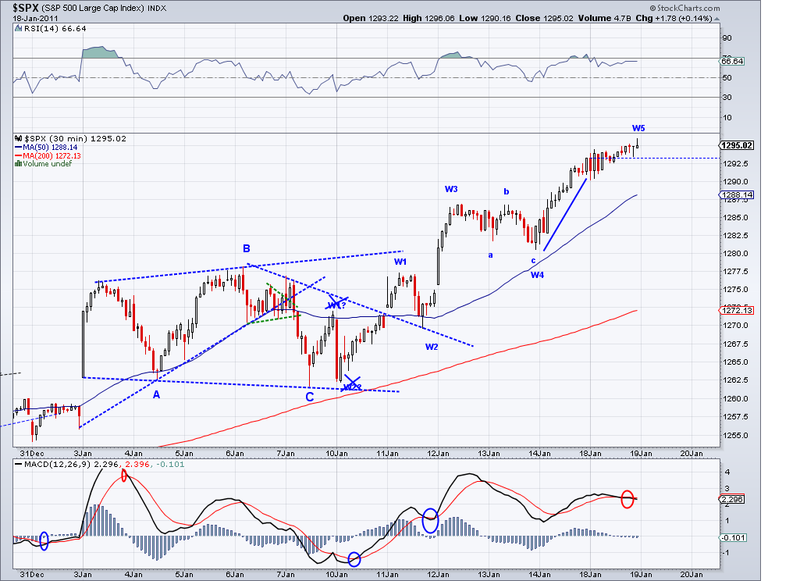 So my expectation if for a W5 to start tomorrow or Monday that will take us above the 1290 level. 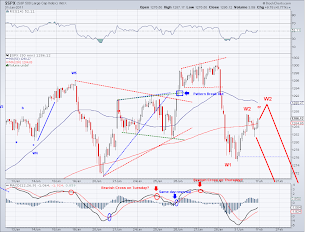 Many EW counters are calling for the final W5 of the rally and given all the technical indicators, it does seem like the end of the rally is coming soon. However, as long as the markets keeps closing above the level (I need to come up with a name for this), the expectation is higher highs. I covered my short again today at 1283 to position trade it since it seems to be that we'll get to 1290 at the very least if not 1300. And I am keeping my long position intact. I wonder what will be the catalyst for the next sell off will be. As of now it seems like the European debt problem might be a good excuse but it could also be lackluster earnings or concerns about the job market. Whatever it is, sentiment should dive as there have been too many buyers (too much optimism) for too long at this point. 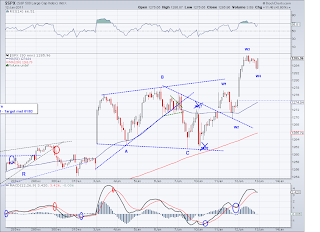 The market busted resistance levels as I speculated yesterday and the rally continues. This obviously eliminates the possibility of a Triple Top and the rally today can be considered part of a W5 assuming all the bouncing off the levels I was posting were corrective waves. Now the question is if what we saw today is only part of the W1 within this W5 or the W5 itself. I posted the target for 1290 for the month of January earlier this month and we came very close today and I am assuming we will see this level tomorrow or Friday if the count I posted is right. I am still holding that short position but I am also holding my longs from early December. And until I see the primary level broken and closed under, I will continue to assume higher prices. It's worth noting that I've been posting this rising trend since early December and the market has not closed one under it. It has tested a few times but has yet to have a truly bearish day which is in itself amazing given how long the market has been rallying. And now that everything looks bullish, there is no better time than a sell off to start. Level to watch is 1272. I eliminated the possible 5 waves up from the chart because of W4>W1 rule violation and in turn the pattern is starting to look like a triple top. 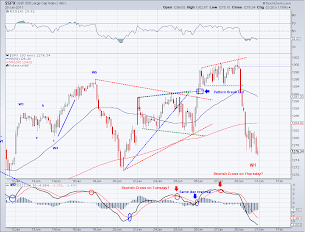 The technicals are in place for a reversal and the MACD has turned negative. 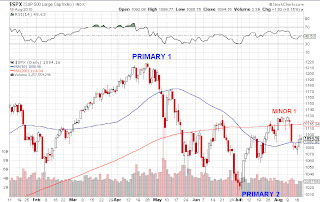 However, until the market closes below the 1269 level, we could see a rally that could bust resistance and the earnings season is usually a good excuse for the market to rally. 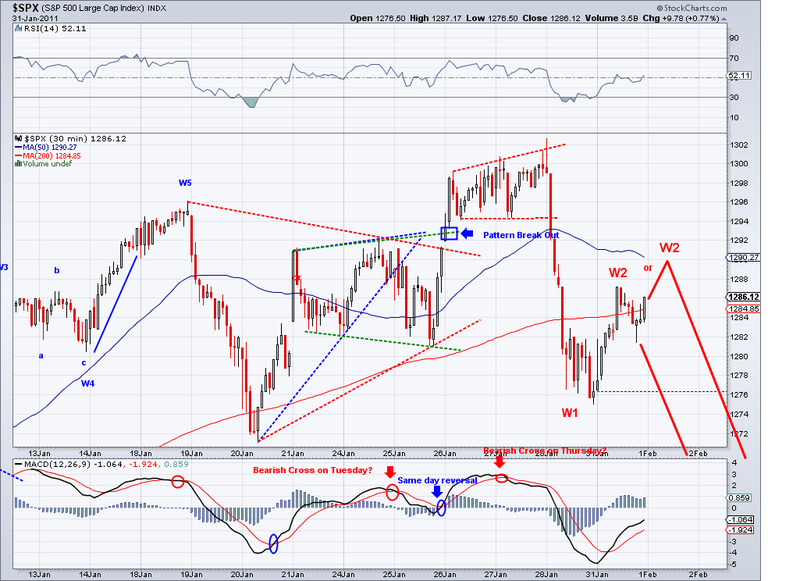 In order to confirm a reversal, the ideal would be a W3 that would break 1269 convincingly. I think we'll get an answer by the next few sessions. Descending Wedge Pattern or Descending Triangle? The market stopped again at gap support and on the SP the pattern looks more like a Descending Wedge, which is bullish and indicative of higher prices to come. 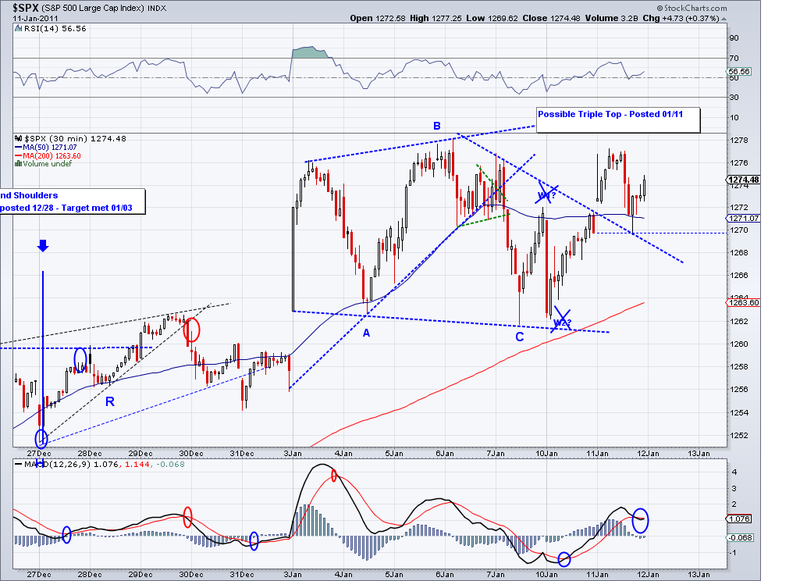 But on the Wilshire, the pattern points to a Descending Triangle which is a bearish set up. So we have two options ahead of us that will become clear in the next couple of days or so. The one thing that supports higher prices right now is the fact the index keeps closing on the level I post on the right. To turn bearish, the market should close underneath this number consecutively to mark a turning point. But so far, every time this level gets bounced off from (and it has been happening since 1230s), a rallies ensues. So we'll see if this will be the case again. With all the "good" earnings coming, I wouldn't be surprised. Back in August of 2010 when I was working on my other site, I posted a long term bearish and bullish count as possibilities going forward for the rest of the year. At that point, the assumption was that were were in a bearish Primary 3 by most EW bloggers and writers. And while I don't really use long term counts to trade because I find time distorts prices, counting waves few months at a time could conceivably work out well for a trader with a long term perspective. The count I want to bring up is the bullish count from August as this has turned out to be accurate on the levels we have reached and how we have reached them. 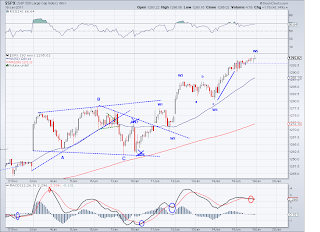 "The bullish count has Primary 1 as S&P 1231 and Primary 2 as S&P 1010. 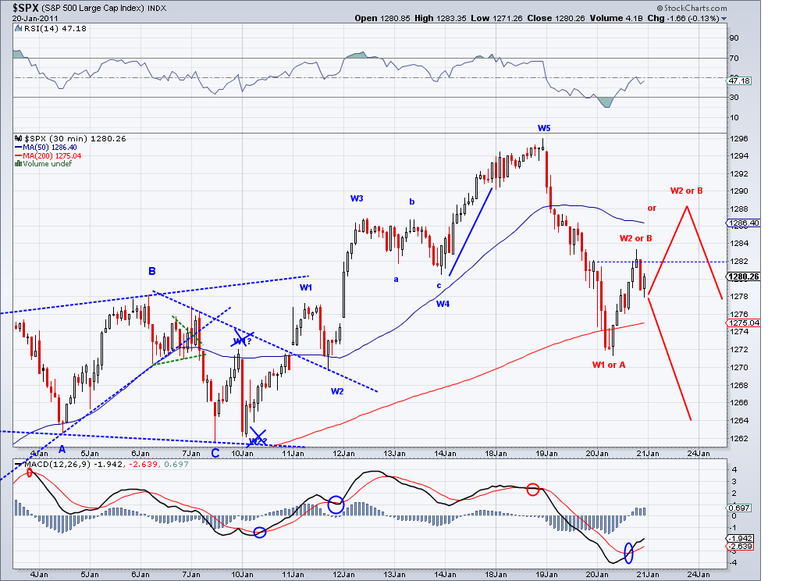 Minor 1 would be at S&P 1131 with Minor 2 still at work or at the S&P 1069 low. This count calls for a Minor 3 upwards in the next few weeks. Therefore, we should know which camp of Elliotticians are right in the next couple of months. As traders, we should watch carefully where we position ourselves during this time and set our stops tight as a lot of traders will lose money for being on the wrong side. 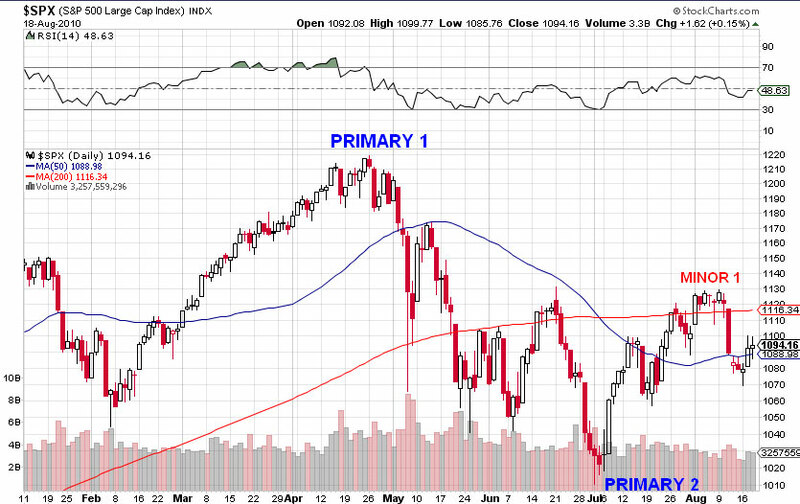 So will it be S&P 1350 by December 2010 or S&P 500??" 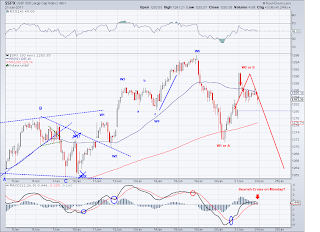 And now looking at the count, I can see a clear ABC move to the triple bottom at 1041 on August 31st that completed a Minor 2 wave. 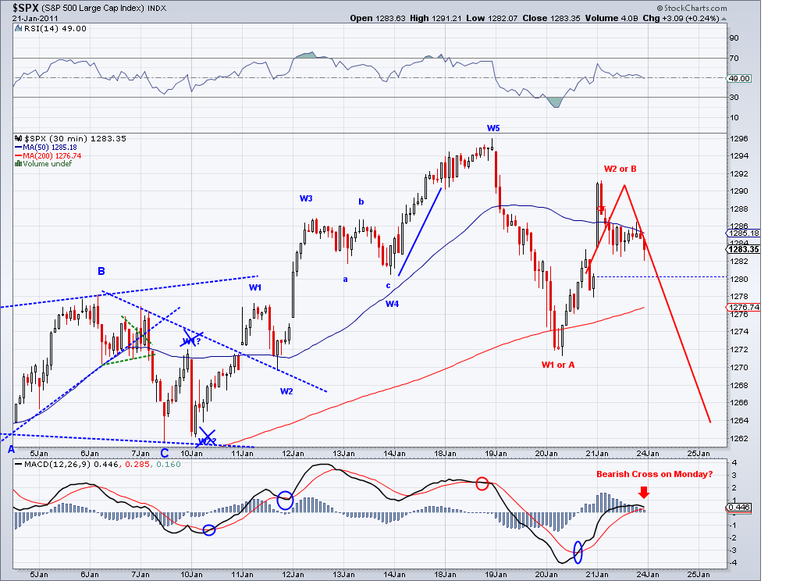 And what followed after that was a Minor 3 wave which is just now ending. So if we are to presume this count is right, we will see a Fib correction and then we will see another push to the 1350 area. As of now, Minor 1 was 127 points and the Minor 3 wave from 1041 has been 236 points so far. If Minor 3 were to be 2 X 127, we would get 1295 on the S&P. So it seems to me like we are getting there soon and wouldn't be surprised if we see 1295 by the end of this month. 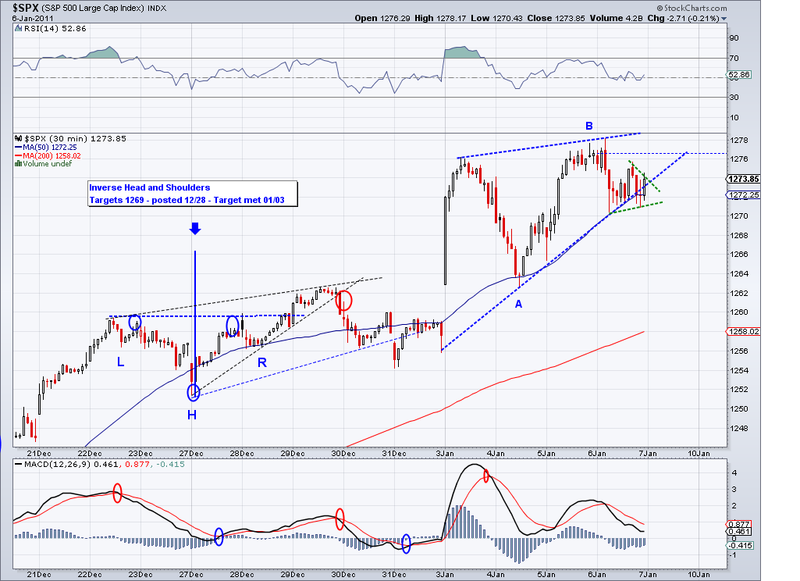 What is interesting is to see what will the correction be like at the end of this wave. We could get that Fib retracement to the 1170 area of correct sideways/triangulate and then push higher so perhaps old S&P highs will be taken out after all at the end of 2011/early 2012. 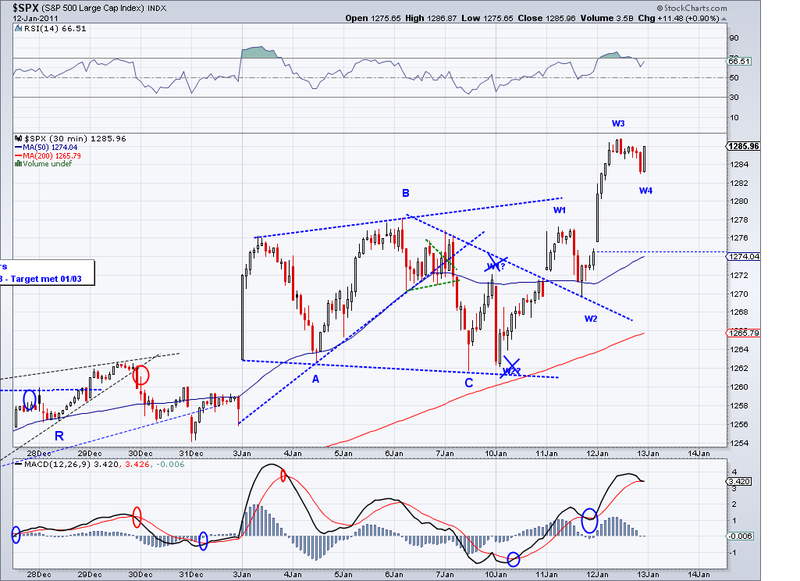 The market completed the "C" leg I was looking for but it did not go to the 1250's area at all. 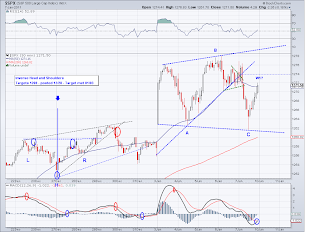 Instead this move has a "Flat" pattern correction in EW terms and that usually is indicative of a coming impulse wave up. Also, the market tested the level I posted yesterday and closed comfortably above it so I am expecting higher highs next week. I'm not doing any changes to my positions so I am going into the weekend hedged. I'm not sure if the rally will finally end next week or the week after but RSI is very overbought on the daily and monthly charts. 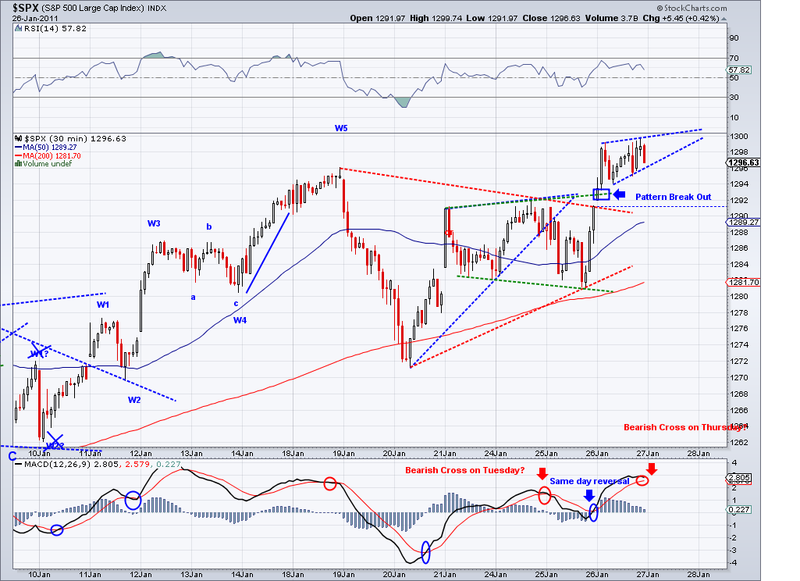 So we'll see the correction to the 1170 area sooner rather than later. 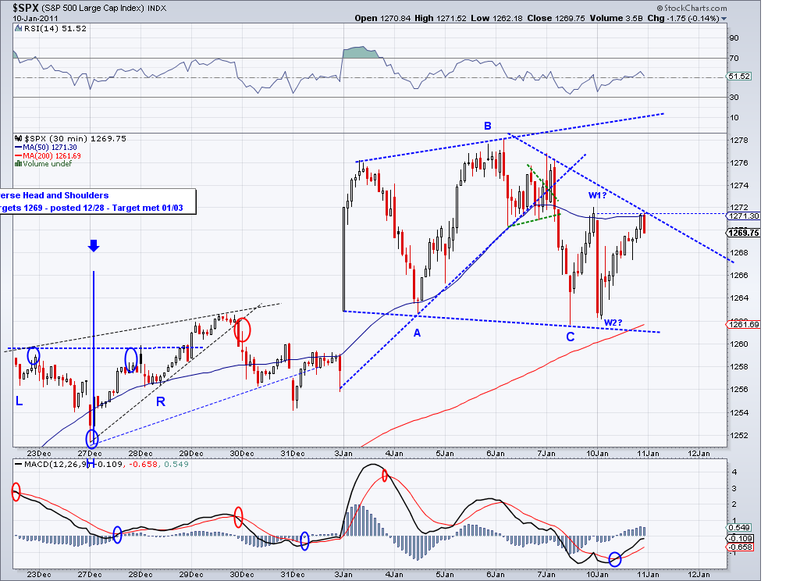 The market broke the lower trendline of the Rising Wedge I posted yesterday but it didn't do so convincingly. And in turn it is triangulating again with intentions for another trust up. 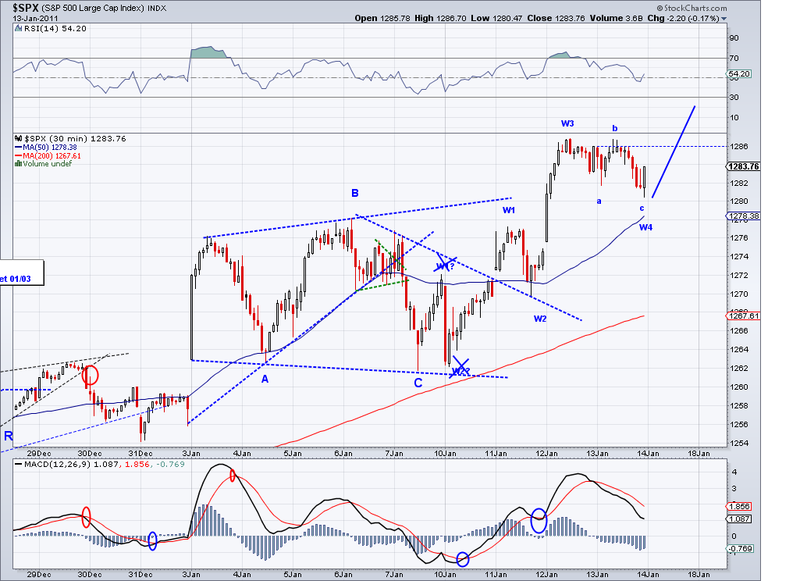 Looking at the MACD and the RSI on the 30 min charts they favor a bullish move in the next couple of sessions. 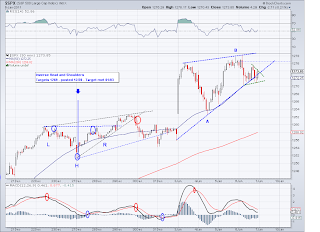 In addition, the market is comfortably above the level I post (1265) so that indicates the bullish bias is intact. Lastly, the EW structure favors a 5w in the minute count to finish up the structure. So we'll see how much longer this will last but I get the feeling when the selling comes, it will be swift. The market pulled back in after hours trading and slightly during the day but I don't think that was part of the C I was looking for. So I am still looking for the 1250 area to get tested. 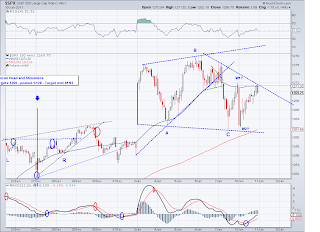 Also, the market has formed a Rising Wedge (a bearish pattern) that should break sooner than later. But as long as the market keeps respecting the levels I've been posting (which rise a few points every day) then the rally remains intact. Almost every single pullback has bounced off at this level or within a few points of this level. I posted the targets for January to we'll see which one will be reached first. In addition, I am planning to change the look of the blog soon and possibly add videos to the site. Another correction or a sell off this week? If the commodities market means anything to this stock rally, today's sell off should be indicating something similar in store for stocks. 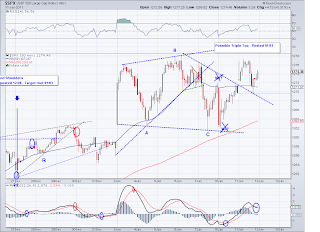 Today's market found support at the gap from Jan 3rd but the pattern favors an ABC move or a 5 wave move. 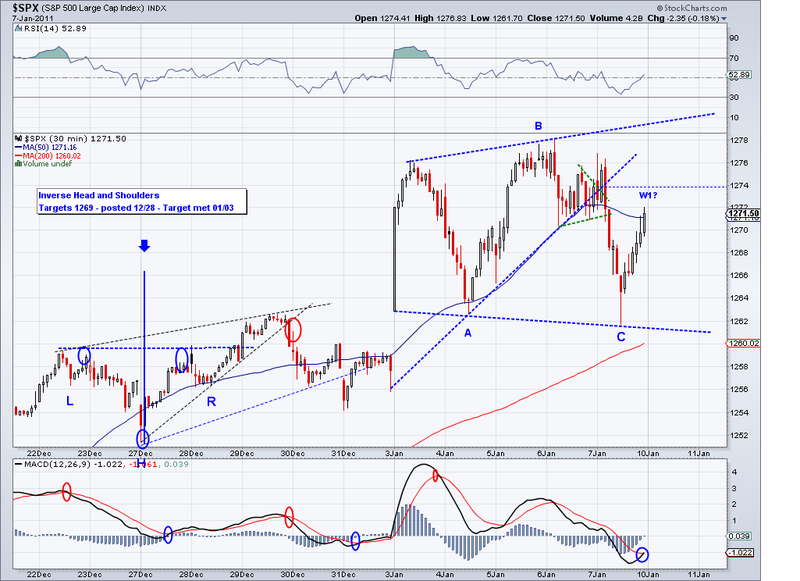 If this is an ABC move that finds support at 1250 then it could possibly shoot up to a new high in a W5 move. But if we get a very sharp sell off that breaks thru the 1250 support area then we can comfortably call a intermediate top. The market could also find support at 1250 then bounce to the 1255-1260 area and form a right shoulder on the H&S formation I mentioned yesterday before a convincing sell off. I am holding my short positions in the meantime and watching how the market behaves in the next couple of sessions. 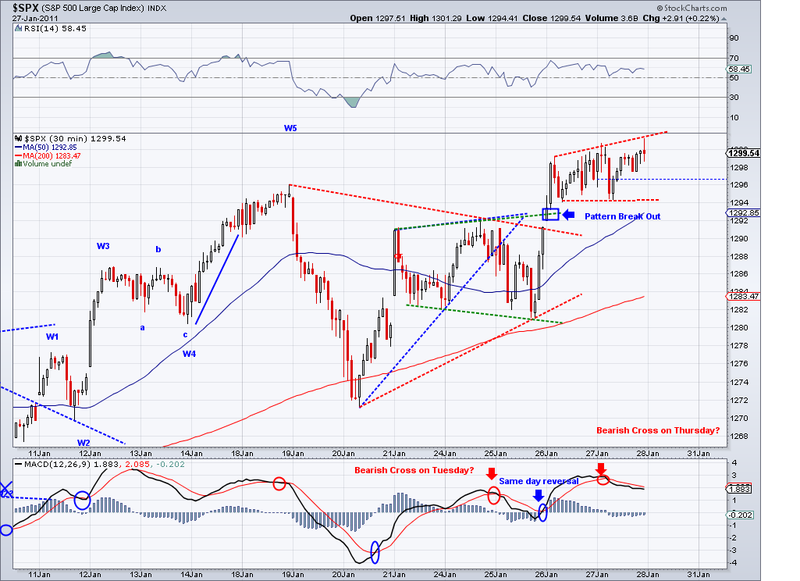 I am looking for closes below the 1261 level to confirm a bearish turn. So we got the gap as I was speculating and it turned out to be an up one. Whenever the level I post gets tested successfully, it usually leads to higher prices. And from how it looks so far it seems like there will be another high before it corrects but there is a cross in the MACD in the last couple hours of today's session so maybe it peaked. I can't post a chart today because I have to wait for stockcharts to renew my subscription to access my charts. 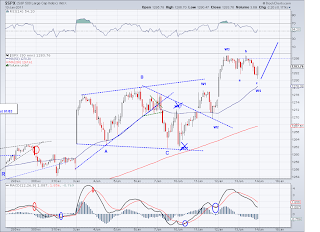 But basically, the pattern looks like a typical Wave 3 with a Wave 4 towards the close. Whether that is a W4 of a 3, a W4 or a complete 5 wave move of the entire structure remains to be seen but the inverse H&S target I posted last week was reached and perhaps this run up will form the head of what will be a regular H&S. I expect a correction eventually to find support in the 1250 area and possibly form a right shoulder ranging in the 1250-1262 price range. Obviously, it is premature at this point to speculate on any pattern but I continue to favor a turn down soon because of how overbought and optimistic buyers are. Usually these conditions lead to very fast sell offs and that's why I am keeping my short position. I am also keeping my longs from early December so technically speaking, I haven't missed anything. - Albuquerque High School chemistry teacher needs your help. 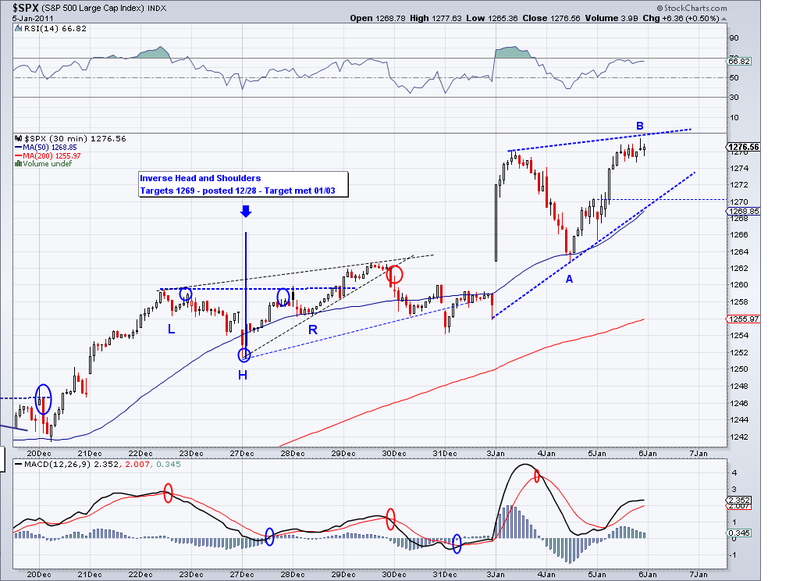 Elliott Wave Trends. Simple theme. Powered by Blogger.